21 cm xvii, 638 p. : ill. 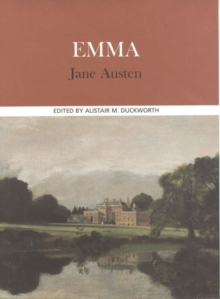 This edition of Jane Austen's 19th-century novel presents the 1816 text along with contemporary critical essays that introduce students to "Emma" from gender, new historical, Marxist, cultural, and feminist perspectives. An additional essay demonstrates how various critical perspectives can be combined. The text and essays are complemented by contextual documents, introductions (with bibliographies), and a glossary of critical and theoretical terms.